Sometimes it's good to think of home decor like a wardrobe: it all comes down to the colors that make you feel comfortable. But if you're like some of us, the shades that make us feel the most like ourselves are, well, neutrals. Luckily, this stunning living room by House Seven Design is a prime example of why bold color isn't the only way to infuse personality into a space. A neutral palette, comprised primarily of whites and beiges, functions as the perfect backdrop to showcase the compelling textures and inviting details that make this look so appealing. A large pendant light adds visual interest that's perfectly complemented by the eye-catching artwork above the mantel. And nearby, a blonde wood coffee table works with the light shade of the rug to infuse warmth into the area as carefully as possible. In fact, organic materials bring in a lot of dimension to the decor — from the plant baskets to the dresser at the far end of the room — while edgy black accents give that layer a sophisticated finish. But it's the daybed that truly gives this living area a sense of stylish comfort, since its open sides and soft edges allow anyone to easily take a load off. 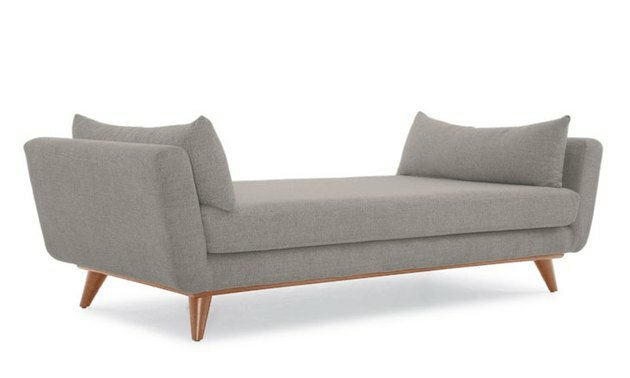 Open up your living room's visuals with this fully customizable daybed.